Easy 25 Minute Chicken Tacos | The BEST Chicken Tacos Recipe! An easy chicken taco recipe made with chicken thighs, plus a simple onion & cilantro topping. This is our all-time favorite chicken taco recipe. They taste like they just came off a food truck! Taco Tuesday holds a strong place in my heart and in the hearts of my kids, but we have been in a major taco slump lately. The only thing I’ve been making is standard ground beef tacos and while those are fine, they just aren’t all that exciting after eating for them the the millionth time. 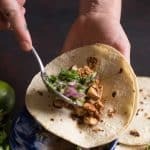 I decided to get a little creative in the taco department and go for some amazingly flavorful but simple food truck-style chicken taco recipes. You guys, they turned out amazing! It only took about 12 minutes to get the chicken cooked, a few more minutes to get the tortillas hot, and then we just threw them together. These tacos are super simple in the fact that they are only made with some chicken meat (that is super delicious and full of flavor) and a simple onion/cilantro topping on corn tortillas. Give the whole thing a squeeze of lime before you eat them, and that’s a wrap! I feel like keeping them simple is what makes them taste like they are straight off of a food truck (you might also call them a street taco), because you’ll just pick them up and eat two. They aren’t fussy, they don’t have a lot of layers, and they are so full of flavor. You could add a bit of avocado or a sprinkle of cotija cheese, but those aren’t really needed. Keep it simple, friends! 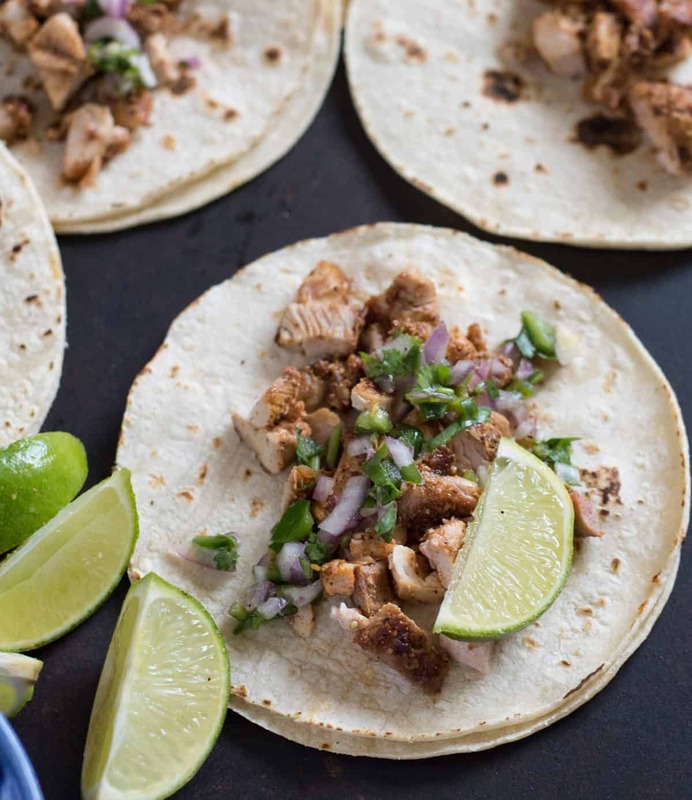 I’ve posted a few recipes using boneless skinless chicken thighs here on Bless this Mess, but I wanted to tell you a bit more about them and why I think that you should use them for this chicken tacos recipe. Boneless skinless chicken thighs are the moist and flavor-packed version of their chicken breast counterparts. They don’t dry out and I LOVE using them. They tend to be a lot less expensive than chicken breasts, which is always a win. Boneless skinless chicken thighs do have a bit more fat on them, but you can trim any visible fat before using and they’ll still be moist when cooked. Here’s a hilarious article from Epicurious about their love of all things chicken thigh, if you need further convincing. Instant Pot Lovers: Here’s my favorite Instant Pot Chipotle Chicken Taco Meat recipe for you. SO good. Have I convinced you yet to try them? Seriously, just get a pound (for a couple of bucks) to make this recipe, and that will be enough to get you on team chicken thigh. So easy to use and full of flavor! Simple & quick chicken tacos made with chicken thighs, with an easy onion & cilantro topping. 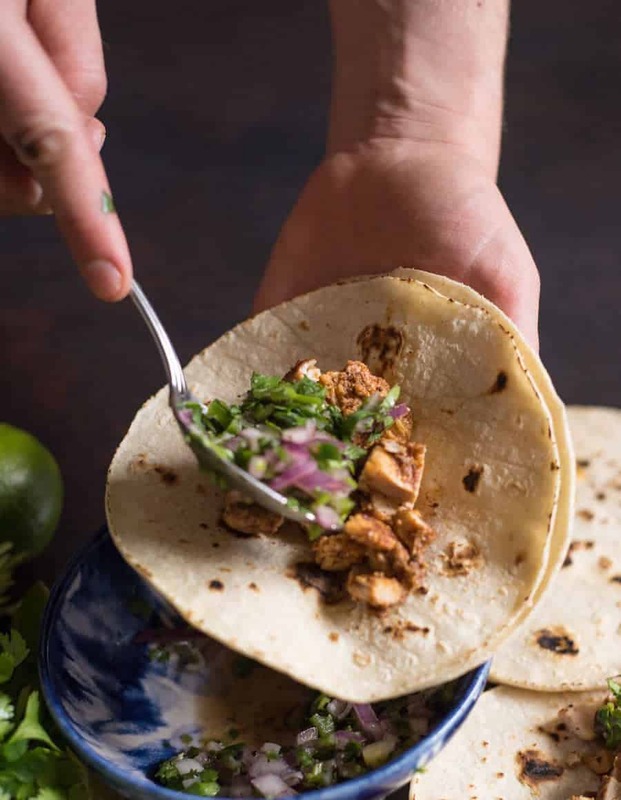 Served on a corn tortilla, this is our all-time favorite chicken taco recipe. They taste like they just came off a food truck. In a large zipper-topped plastic baggie or in shallow dish, add the chicken, all of the spices, lime juice, and oil. Close the bag and use your hands to mix everything together. If you are using a shallow dish, use tongs to work the spices evenly into the chicken. You can let this rest for up to a half hour or work with it right away. I like to let it rest a minute to increase the flavor. Heat a large skillet over medium to medium-high heat. When the skillet is hot, add the chicken. Cook for 12-14 minutes, turning once, until the chicken is cooked through. Remove the chicken from the pan and let it rest for 10 minutes. 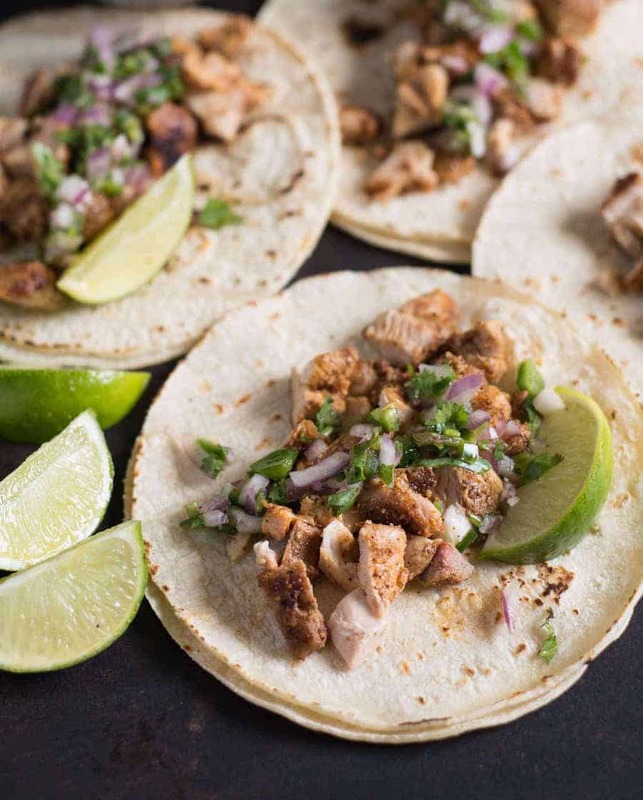 While the chicken cooks, stir together the chicken taco topping by placing the chopped onion, cilantro, jalapeño, and the juice of one lime in a small bowl. Add salt and pepper and stir to combine. While the chicken rests, wipe your skillet clean with a warm rag or paper towels and place the skillet back on the heat over medium-high to high heat. Place two tortillas (still stacked together) on the skillet and cook until the underside starts to char. Flip over and cook the other side (so the middle of each tortilla won’t be cooked against the skillet but it will get warm all the way though). Repeat with remaining tortillas. Chop the rested chicken into bite-sized pieces. To serve, place 1/8 of the chopped chicken in each set of tortillas (still two stacked together) and top with 1/8 of your onion mixture. Serve each taco with a wedge of lime to squeeze over the taco just before serving. The two tortillas aren’t a must, but it helps to keep everything in. When you just use one tortilla they seem to break and fall apart. If you don’t want the topping too spicy, you can remove the seeds from the jalapeño or omit it all together. The lime for serving isn’t optional, it really makes the dish! Because these chicken tacos are so simple and easy to make, feel free to add a side of chips and salsa and guacamole plus some fun drinks (I recommend some fresh homemade lemonade for this recipe!). You’re going to feel like you are eating out while sitting in your own kitchen. 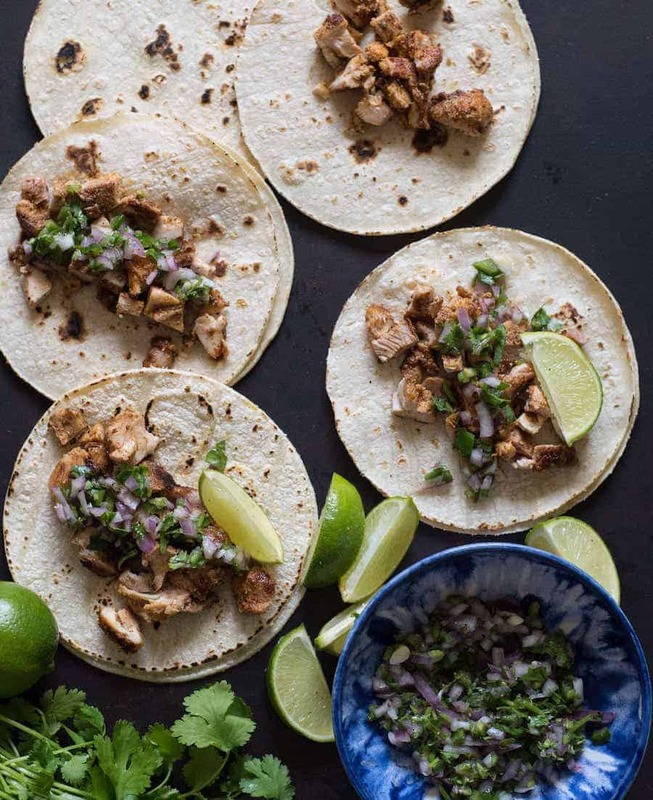 I can’t wait for you to make these tacos, try boneless skinless chicken thighs (if you aren’t already using them), and to thank me after you make this awesome meal. Enjoy, from my kitchen to yours! This looks great. Wrapping food in a tortilla is a great way to get kids trying new flavors! I also saw you have some new features on your home page. Looking good! I would take chicken thighs over breasts even if they cost twice as much. Juicier, more flavour – just better. Love this! I absolutely love chicken tacos! I could eat these for dinner every day! YUM! Do I cut the chicken before or after cooking?! Cook them whole and cut them after they rest a bit! Terrible instructions. Great dish! I cut after cooking. 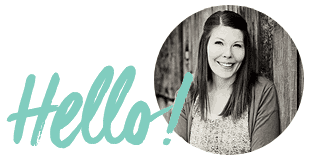 I’m all about improving… what’s so terrible about the instructions? Not quite as good as our favorite taco truck, but they definitely held their own! Only thing for me was that, I trippled the recipe (for 3 pounds of chicken) ; for me there was a bit much like juice incorporated… Although I did let the chicken marinate for the full 30 minutes, so maybe that’s why? Anyways! Great recipe none the less..
Yep, that would work just fine. Seriously fabulous… Didn’t change a thing and loved every last bite. Thank you for adding a great recipe into our Taco Tuesday rotation! Night. Lime, lime,lime. Over powers the whole thing. I would suggest no lime in the marinade or in the onion and cilantro mix. If you want lime just use a quartered lime at the end to flavor as needed. Gonna have to think of a way to season the rest of the chicken to cut the lime taste or else ill just toss it. Ill try another recipe next time. This was freaking bomb! We added some Diced Roma tomato to the topping and left out the jalapeño. We also used warmed pita bread as it’s all we had. But I’m sure tortillas are just as good maybe better? I don’t know. The topping was fresh and it paired nicely with the warm chicken and the spices along with it. Delicious!!! Thanks for the recipe. I don’t have garlic and onion powder, can i use fresh ingredients? Quantity? Love this recipe! Hubs is always going to local curbside taco stand for these authentic but simple taco, without all the other stuff he doesn’t want on his taco, thanks again.. Hubs says thanks too!!! So glad you liked them! That’s the perk of using really flavorful meat, you don’t have to cover it with much else for it to taste great! Oh my goodness! I loved it and so did my family. So delicious!!! Horray for a successful dinner! And thank you so much for coming back to leave a great review, I appreciate that. Delicious! Will make this again. And again. Thanks! So glad you liked them as much as we do! Happy Taco Eating friend! Loved this recipe! Never tried with chicken thighs before, and it truly made a difference for us in our quest to replicate our favorite tacos since moving away from Texas. I always find the corn tortillas we buy are always so dry (and too thick). Any brand recommendations would be much appreciated. Thanks! I really like the Mission brand white organic tortillas. And thank you for a great review, I really appreciate that! How are you preparing your tortillas? I find that if I spray a little cooking spray on both sides and toss them in a skillet for 10-20 seconds per side they are really good. And I do want to note, I just used chicken breasts and pounded them down thinner instead of using chicken thighs. A bit healthier for sure and no complaints on flavor! Great idea and thank you for sharing! 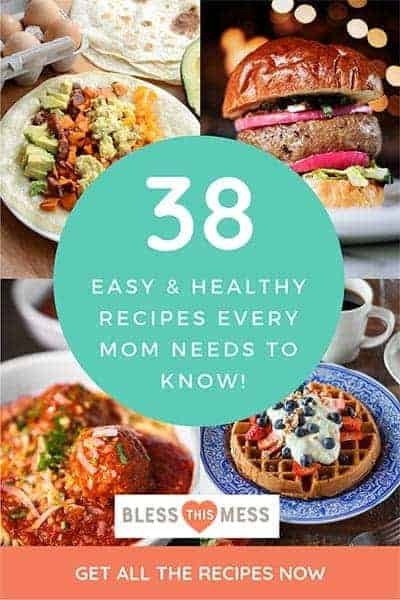 I often have people ask me about using chicken breast so this will be a great resource for them! My family loves these tacos. My kids even like cilantro onion salsa. I tried cooking the chicken in a skillet the first time and the chicken ended up being blackened. The last 3 times I have grilled them and it was even better! Thanks so much for the recipe. Sounds so good! My kids like the salsa too which isn’t super typical for them, it just goes with it! We love this recipe, really authentic easy tacos. I cooked them in the oven though as I found that easier! Such a great tip to make the recipe a little more hands off! So glad you like them Emma! I made these last weekend for my birthday. I made pork shoulder tacos as the main dish, but one of my friends doesn’t eat pork, so I also made this chicken. And it was a huge hit. She loved them, as well as the other people who tried some of the chicken. Sooo full of flavor. Great recipe! Hooray! I’m so glad that everyone like it. Thank you so much for coming back to leave a comment, that’s so helpful! My fiance and I enjoyed these very much! I WILL be making them again, the exact same way, except I added salt to the thighs, I almost could have gotten away without ANY, with exception of the topping, as your recipe states. Thanks for sharing! Looking forward to making these tomorrow night! I love the idea of grilling it, totally trying that soon!